Nungesser Lake is the headwater of the entire Gull rock, Keg, Red, Little Vermillion, Nungesser Lake chain. Nungesser is about 25 miles long. The lake has approx. 30,000 acres of fish holding structure. Nungesser has rock shorelines, sand bars, mid lake reefs and humps, deep water access, long shallow bays for forage production and lot’s of lush cabbage and reed beds. 24 rivers and feeder creeks provide excellent spawning areas for Walleye, Pike and the forage that they depend on to thrive. 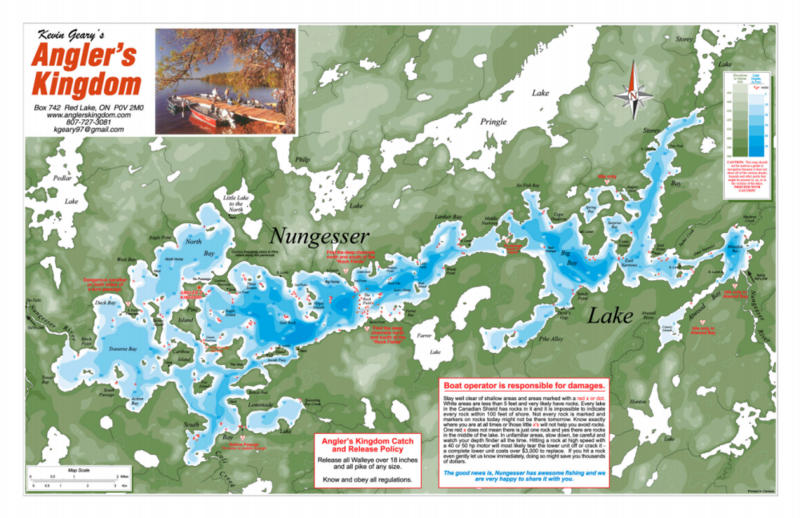 Nungesser has phenomenal numbers of Walleye and depths of over 50 feet hold plenty of trophy-sized walleyes. 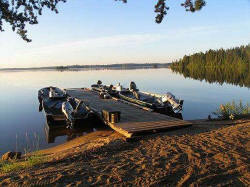 It also has far above average Pike fishing with a large number of trophy fish. Click here for a PDF of the map above you can print out!! CURRENT FISHING REPORTS AND NEWS!